Here are all the technical details for the famous Grundig Satellit 700. This book includes an exhaustive analysis of one the finest portable shortwave radios ever made. 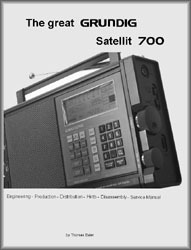 Table of Contents: Preface, S700 History, Editions & Production, Versions, AGC/MGC Preselector, Hints & Modifications, AM/FM Test Mode, FM-RDS PI PTY Mode, Buying A Second Hand 700, Mint in box, Satellit 700 and Its Successor, Advertising, Booklets, Disassembling & Lithium Cell, Indicator and SSB adjustment, Satellit 500/700/900, Owner's Manual, Service Manual with Schematics. Printed in Germany. ©2002. 60 photos 117 pages (8.2 x 11.4). Click here to view larger cover. (Note: This book is temporarily out of print). Order #1524 ..... T.B.A. Please note this title is temporarily not available. Copyright 2002-2018 Universal Radio, Inc.